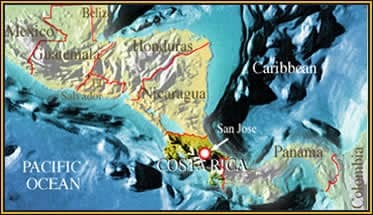 Location: Costa Rica is a small, environmentally aware, Central American country between Nicaragua and Panama. Some dart-poison frogs are know to be possess highly toxic skin secretions but when they are kept in captivity their toxicity quickly diminishes until they are completely non-toxic. What is more, their captive bred young never develop toxic skin secretions. Toxinologists and bio-medical researchers are interested in skin secretions with an eye to the production of new, potentially live-saving drugs. Dart-poison frogs are believed to obtain their toxic skin secretions from a varied diet of rainforest floor invertebrates, but since this diet is impossible to duplicate in captivity captive dart-poison frogs quickly become non-toxic and are of little value for research. 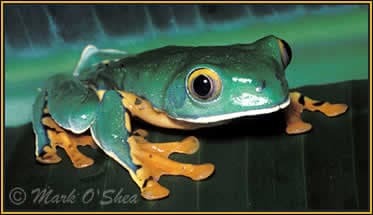 What is needed is a frog that possesses toxic skin secretions, of a genetic rather than dietary origin, that will not diminish in potency under captive conditions. Some neotropical treefrogs fit this pattern and treefrog expert Andrew Gray has for some years been involved in a captive breeding programs to study skin secretions and conserve frog species which are becoming increasing endangered in the wild. Mark joins Andrew and his fieldworker Miguel on a quest to find one of the largest and most threatened of these frogs, the Splendid leaf frog. Being a snakeman Mark is still on the look-out for venomous reptiles and he meets one of Latin America’s most unusual mammals, the three-toed sloth. A close view of a Splendid leaf frog (Agalychnis calcarifer), the “Jewel of the Jungle”.